We think you’ll be glad to read about some news and special happenings, and you might like seeing Part II of my Rambling about the 25-year history (now nearly 26!) of this little enterprise. For many reasons, Nancy and I are more grateful than ever that we get to play our roles with this organization and in this community. Thank you 10,000 times for supporting us by choosing to dine and/or stay at our places! Without folk showing up, we’d have to pack up and try something else, and we don’t want to do that. This is too much fun! As always, we are honored that you choose to receive these letters, and we hope you find them useful and entertaining. If you don’t want to continue to get them, please email us at qwrhinfo@qwrh.com and tell us. Conversely, if you wish to receive more frequent news, please sign up on any of our websites or Facebook pages. These letters are written in first person by me, Dennis, but many people contribute to them. Lucky’s Incredible Skillet-Fried Chicken…Now on Sundays! (We’ve served this on Tuesdays for the past couple of years, but starting May 24th it will move to Sundays! On Tuesdays, we’ll still have live music, as well as some value-priced wines and Southern snack options. )Starting at 3 PM each Sunday at our Greensboro Lucky’s, just after we quit serving from our brunch menu, we’ll start dishing up this extra-special fried chicken! (FYI: Skillet-Fried Chicken is staying on Wednesday nights in Cary.) This is good stuff, pan-fried in locally rendered lard, served with mashed potatoes, giblet gravy, collard greens and a hunk of dipping cornbread. You can also get it packed up to take home or for a picnic. Please look at our “Get Lucky & Go” menu. You can get quarts of our collards, soups, “beans and greens,” whipped sweet potatoes, creamy grits, pimento cheese and artichoke dip. We have five “family meal” options: Ribeye, Stew Beef, Meatloaf, Shrimp & Grits and Jambalaya. Consider our “Heat & Eat” option: Pick one of your favorites, such as our Black Bean Cakes, and we’ll have it prepped but not cooked, ready and waiting for you, along with easy “Heat & Eat” instructions. Over the 16 years since we started offering afternoon tea in the Social Lobby at O.Henry, it has become quite a tradition; so much so that we decided to expand the serving hours. 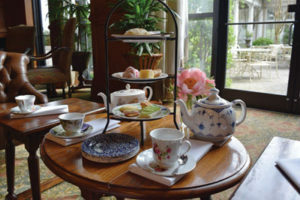 Now, we serve afternoon tea Friday, Saturday and Sunday, Noon–5 PM and Monday–Thursday, 2-5 PM. A national magazine, TeaTime, also has taken note of our nostalgic take on afternoon tea, featuring us in the “Gone to Carolina” tearoom article in their May/June 2015 issue. To check out our special themed teas, visit ohenryhotel.com/o-henry-tea/. The Live music Thing Is for Real! 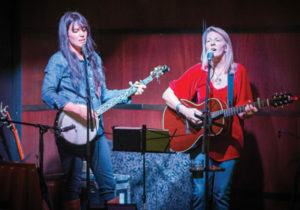 Tuesdays | Lucky 32 Greensboro – Songs from a Southern Kitchen: Laurelyn Dossett, Molly McGinn, Martha Basset or some other impressive musician lights up the bar! All that, plus value-priced wines and some special Southern snack options! What’s not to like? Tuesdays from 6-9 PM. Check our the performance schedule on our website. Wednesdays | Print Works Bistro – Mussels-Wine-Music: AM rOdeO (Evan Olson and Jessica Mashburn) rock with fantastic covers and original lively music. Also, enjoy delicious mussels (more for less, with our hand-cut fries) and six wines from $10 to $15. Wednesdays from 7-10 PM. 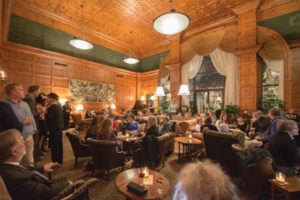 Thursdays | O.Henry Hotel Lobby Cocktails & Jazz: Settle into this commodious lobby, listen to fantastic American Jazz, enjoy craft cocktails and nosh on Mediterranean tapas. Local legends Neill Clegg and Dave Fox perform with vocals by a rotating group of their talented friends. Thursdays from 5:30-8:30 PM. Visit ohenryhotel.com/o-henry-jazz/ to see the schedule and menu and to learn more about the artists. Plan a Getaway at Our Places! Sustainable Summer Weekend Getaway at Proximity: Reduce your stress level and your carbon footprint at the same time. Check in early at 2 PM, and spend the afternoon traveling the nearby Greenway on our complimentary bikes or lounging by our infinity-style pool. Use the included $30 voucher for dinner or breakfast on Print Works Bistro’s creekside terrace. Prolong your rejuvenating getaway with a late checkout of 2 PM. This extra-special offer is available on Fridays or Saturdays, May 29-September 5. $229 plus taxes. PLAN A ROMANTIC RENDEZ-VOUS AT PROXIMITY! James Taylor: Stay with us for the James Taylor concert. Visit our websites or call O.Henry at 336-854-2000 or Proximity at 336-379-8200 for details on this special offer. Available Friday, July 31. This is one of America’s largest and longest-running celebrations of arts, culture and heritage. Greensboro will host it for three years—2015, 2016 and 2017. Attendance is FREE, and 100,000 to 175,000 people are expected! When this group says “folk,” they mean artistic celebrations with deep, grassroots cultural expressions that have been passed down over generations. It includes music, dance, crafts, stories and even foods. With music, it is everything from country, blues, gospel, jazz and polka to Celtic, bluegrass, mariachi, western swing, zydeco and much more. They’ll need more than 1,000 volunteers. You can learn more at nationalfolkfestival.com. FYI: We are offering a custom hotel package for this (mentioned earlier). Visit O.Henry Hotel and Proximity Hotel websites or call to book. 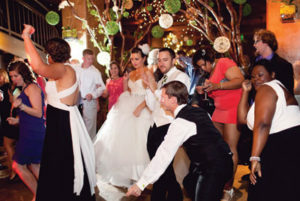 BROWSE WEDDING PHOTOS AND STORIES ON OUR GREENSBORODREAMWEDDINGS.COM BLOG. We love hosting all types of special celebrations and business gatherings in our multiple private and semi-private venues. From simple things like being able to pre-order your group’s lunch at our restaurants to hosting elegant soirées for up to 400 people…. O.Henry and Proximity Hotels offer bespoke events, from receptions and grand dinners to office retreats and seminars. Call our events team at 336-544-9615 or send us an inquiry by visiting ohenryhotel.com or proximityhotel.com. Lucky’s in Cary seats up to 70 people in a semi-private dining area. Call 919-233-1632. Lucky’s in Greensboro’s private Starlight dining room seats 10, and we can host larger parties in the dining room. Call 336-370-0707. Already have a venue for your event, but need great places for your guests to stay? Call 336-478-9111. Our restaurants and hotels offer gift cards for purchase seven days a week on-site, or you can order online at qwrh.com. Customize a gift certificate for a hotel night stay (or even a variety of packages) for your fortunate recipient by calling Proximity at 336-379-8200 or O.Henry at 336-854-2000. 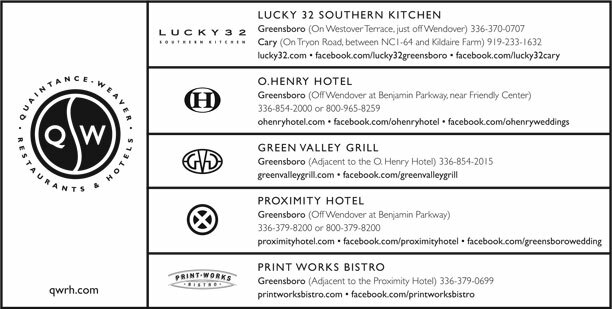 Visit printworksbistro.com, greenvalleygrill.com and lucky32.com for our current seasonal menus, lots of recipes, the latest wine lists and online reservations. Heading our way and don’t have reservations, but are concerned about waiting for your table? Use our call-ahead seating to put your name on the waitlist (if we have one). With larger parties, we offer pre-ordering to expedite service so you have more time to enjoy your visit. Let us know when you make a reservation if you would like to pre-order. Just email us your orders by 10:30 AM for lunch and 4 PM for dinner, and we’ll have your meals served within minutes of arriving. Call the restaurant or go to the Hours/Reservations section of our restaurant websites for a pre-order form. What’s better than dining out of doors? Our garden dining rooms are really pretty great! We’re Looking for Future Lucky Stars! It would be a great favor if you referred folk who might enjoy playing restaurant and/or hotel with us. We are looking for friendly, competent people who will join us in being of genuine service to our guests and colleagues. From entry-level jobs to leadership roles, we need even more energetic and enthusiastic people. Some of our current openings include: restaurant servers and front door staff, hotel guest services staff, finance and audit manager, and hotel sales manager. See our current openings online and check back often. Apply online or apply directly at one of our businesses. Restaurants between 2 and 4 PM, Monday through Saturday. Hotels between 1 and 3 PM, Sunday through Thursday. If you’d like to come by at other times, please call to set up a time to meet with one of our leadership team members. A Lucky 32 Southern Kitchen recipe. Get more recipes at our lucky32southernkitchen.com blog and lucky32.com. Cut each tomato in half and squeeze out seeds. Season to taste with salt and pepper. 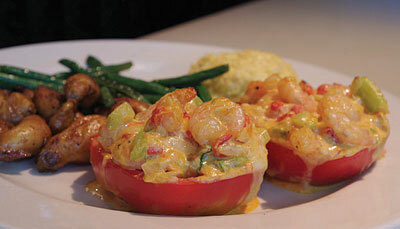 Top each tomato half with about 1½ ounces of shrimp stuffing, then top with some pepper jack cheese. Bake at 350 degrees until cheese is melted (about 3-5 minutes). Makes 12 halves. In a sauté pan, melt butter over medium heat. Sauté shrimp, onion, celery and peppers until shrimp are done. Stir in garlic, mustard and Creole spice; remove from heat and place in a bowl. Allow to cool slightly (only slightly). Add mayonnaise, cheeses and Worcestershire. Combine well. Makes 18 ounces. Add all ingredients to a large bowl and combine with a whisk until spices are evenly distributed. Store in an air-tight container with lid. Makes ¾ cups.